Clear Glass and Clear Stained Glass? Ive seen a few texture packs for clear glass, but none included stained glass. Any one know of one that does? The basic modification shouldn't be all that hard to do, and people around here tend to be more than willing to assist you with questions. Who knows, it may set you on the path for a pack of your own. CTM support is a whole other beast. ~43 individual textures per color. *shudders* Its why I don't bother with CTM support. Its great, but the work load builds up exponentially the more you want to use it. On my pack I use an uncolored CTM set for all stained glass per-metadata, and it's recolored using custom colors so it's lower resource use. With MCpatcher it uses innerSeams. It is decorative clear glass CTM (block form only.... pane form has placement issues IMO) but my pack isn't "faithful" in some senses so OP probably wouldn't like it. I thought metadata was removed. Per medatata? How is that even possible? Or is that a McPatcher thing? Yes. I *think* it may be possible with Optifine? I dunno. You could try it. Not sure about the recoloring, either, but if it was all gray glass or not connected then it doesn't work. Well yeah, I guess technically 'blockstates'..... but same thing as metadata really, just in text form. I should have been more specific, I just meant it as a fancy way of saying 'It uses the same CTM but connects only to itself, not other colors of stained glass". Well really nothing special, each stained glass block just has CTM but 1 source image. could you maybe explain to me how to do this? I have clear stained glass textures, and really don't want to have to edit 40 something pictures per color just to use with CTM. Please. 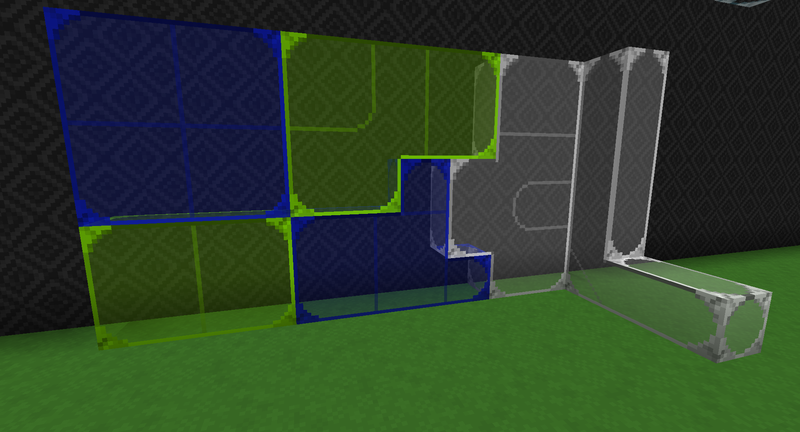 Well, first off I have a .properties file for each color of glass. Secondly I have ANOTHER set of .properties files for custom colors (annoying, I know), to color them in. Note, I'm not exactly sure my reasoning behind number names with CTM (defining block/blockstate in the file) and then naming custom color designations with block info... or even if there WAS a reason. Theoretically you should be able to use the same names for both. A bit outdated but still useful. Biggest thing is that you should use naming as I have (block names+block states rather than IDs+metadata). although my pack is double-dead anyways. It was discontinued for a while (mostly because I'm not interested in the game anymore) and then 1.9 broke all of my model displays (it also broke my dreams for entity models/better shaders). Also yes, the CTM/color aspect still works in 1.10.2 with Optifine.